“Denial, Vanity Press Style” — Josh’s first day is filled with petty grievances and massive egos. “Bowling for Change” — Josh joins his Vanity Press coworkers for an intense night of… bowling. 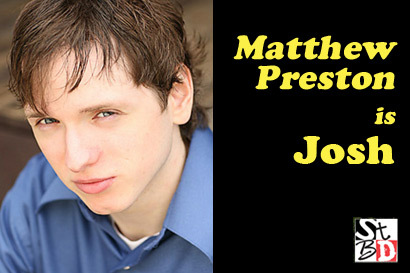 Matthew Preston recently garnished a lead in the short film Circle Choice as Jonathan, played a priest who moonlights as a drag queen in Public Image, and a computer nerd in the upcoming Point Park comedy High, How Are You? He also did an Off-Broadway show called “Villains” as John Wilkes Booth, played Jimmy in “Thrown” which was the first show for the New Works Festival. He has a hosting gig on “SON Insider,” and was also the stand-in for Jensen Ackles in for the horror film My Bloody Valentine 3-D.
Preston has starred on the hit radio soap opera Scripts and Scruples since 2005. He can be heard hosting the online radio show “Buzzworthy Radio” with fellow S&S star Na’Vell J. Lee. During his limited free time, Preston is also an aspiring screenwriter.